« Is Artificial Food Coloring Safe? I cook these regularly for my kids, but last weekend I served them to my husband for breakfast with softly fried eggs and a little hot sauce. They were delicious and an excellent way to have a savory breakfast and give the sweet a break. 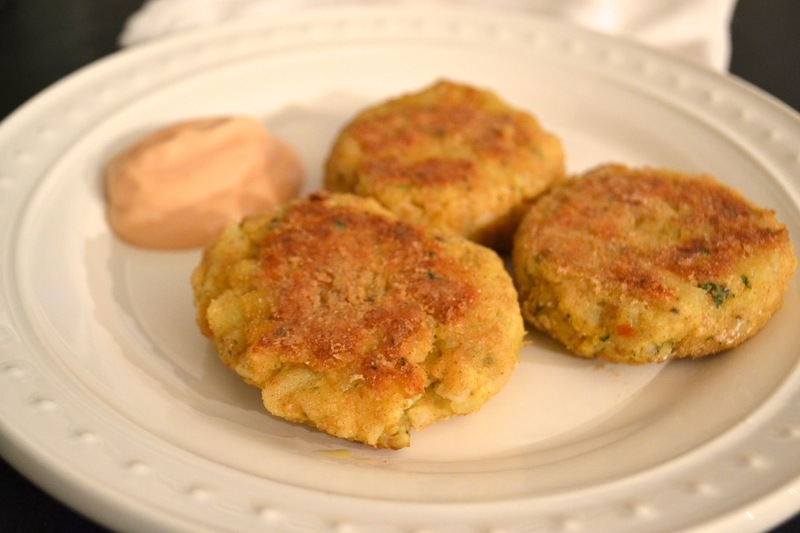 As a side note, I like preparing these fish cakes for my children because they won’t just tuck in to a fillet of fish, and I am always looking for ways to get more healthy protein into them. They appear to share my slight aversion to “flesh,” so I typically incorporate chicken, beef, pork and fish into more complex dishes, or at least dishes that don’t just resemble a slice of meat. For this recipe, try Petrale Sole, Tilapia, or any other relatively light fish. Salmon also works well. Cut the potato(es) into quarters, leaving on the skin. Put in a pan and cover with water. Boil under tender. Drain. Chop into 1/2-inch cubes, although some will mash down while you’re cutting which is fine. Heat a cast-iron or other skillet on medium heat. Add a teaspoon olive oil or ghee. After the oil or ghee has melted, lay in the fish fillet(s). Cook until done but still very moist. Combine all the ingredients except the flour in a large mixing bowl. Stir until well combined. It may seem a little wet and sticky, but that’s ok.
Heat a large cast-iron or frying pan over medium heat. Add a little olive oil or ghee and swirl to coat. Make sure there is enough “fat,” to coat the pan just by swirling (not pushing a spatula around) otherwise your fish cakes will end up too dry. Put the flour in a small, low bowl. Form 1 rounded soupspoonful of potato/fish mixture into a patty 2 1/2-3 inches in diameter and 3/4-inches thick. Place in the flour and flip to coat. Place in the pan and repeat until all the mixture is used up. Cook for 5-7 minutes then flip the cakes with a spatula and cook an additional 4-5 minutes until golden brown on both sides. Add a little more oil or ghee if needed. Allow to cool slightly on a plate covered with a paper towel. Squeeze a little lemon juice over the cakes just before serving. Serve warm with cocktail or tarter sauce for a lunch or dinner. For breakfast or brunch, serve the cakes topped with fried eggs and hot sauce. For a fancier brunch option, serve them topped with poached eggs and a simple hollandaise sauce. These keep for several days in the refrigerator in an airtight container, and can easily be reheated in an oiled pan over medium-low heat. *Fresh dill is also a great choice, but the flavor is too strong for my kids so I use the other three spices listed. **If you are gluten-free, you can obviously substitute the spelt with a GF option. However, many GF flours add more stickiness. I haven’t experimented with GF flours yet for this recipe, but would love to receive feedback from anyone who does.